St Editha’s is a Victorian church built in 1864 on The Village Green where Christianity first began in Amington in the 12th century. Presented by the Lord of the Manor, Charles a’court Repington, this Warton and Derbyshire stone built edifice was designed by the architect, George Edmund Street in the late 13th century Gothic style. The church is dedicated to St Editha who founded the Benedictine convent at Tamworth in the 10th century. She was the granddaughter of King Alfred the Great. The church consists of a nave of three bays, intended to seat 200 people. From the beginning chairs have been used instead of pews. There is an arch braced roof topped by a bell-cote containing two bells. A carved alabaster war memorial dominates the central north wall. placed, unusually, in accordance with the Greek Church. 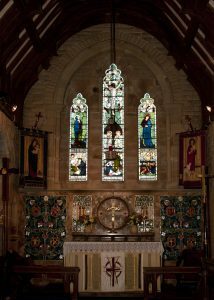 The church is proud to possess four richly coloured stained glass windows: two by Burne-Jones (executed by William Morris), a canopy by Philip Webb, the original east window from the previous church by William Wailes, and a memorial window by Powell’s of Whitefriars. Next to the chancel the former Guild Chapel houses the unique tracker action organ built by George Maydwell Holdrich in 1885. This is a small instrument but with a full tonal character. 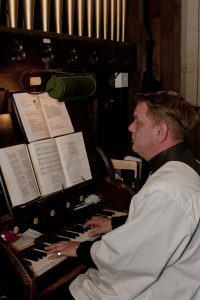 The choir vestry is behind the organ which then leads to the clergy vestry. The churchyard, covering 1,466 square yards, has 427 interments and was closed to burials in 1937. Many of the gravestones were laid flat in 1951. 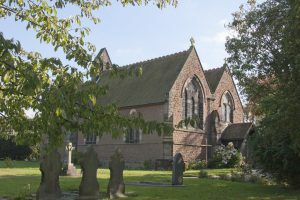 An ashes burial plot was created in 1988 for local people who could demonstrate a connection to the church. All present interments take place at the village cemetery which opened in 1912. The Church Hall is in part of the Old school complex, which is approx. 500yds from the Church building and is leased to the Tamworth Cornerstone Housing Association, (TCHA), with the Church having its use evenings and weekends. As part of this extended building, it also has a coffee shop, meeting room and the Church office.